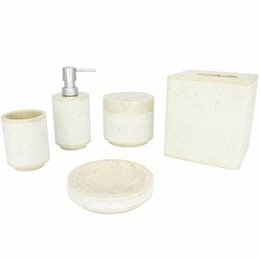 This 5-piece bathroom accessory set Lya consists of a Soap dispenser, Toothbrush Cup, Toilet Brush Holder, Soap dish and a Jewellery box. 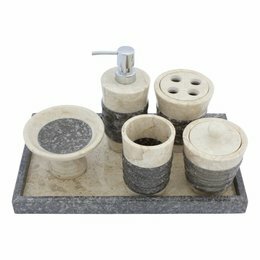 This 4-Piece bathroom accessory set Java Squa consists of a Soap Dispenser, Toothbrush Cup, Soap Dish and a Jewellery Box. 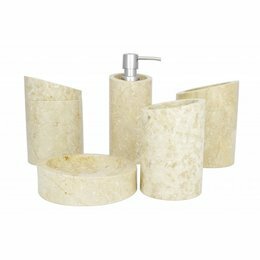 This luxurious 5-Piece Marble bathroom accessory set Soemba consists of a Soap Dispenser, Soap dish, Toothbrush Cup, Jewellery Box and a Tissue Box. 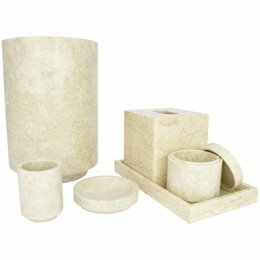 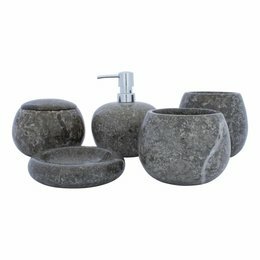 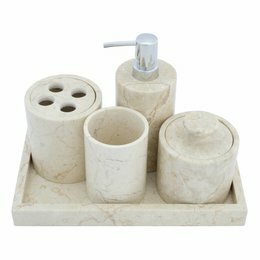 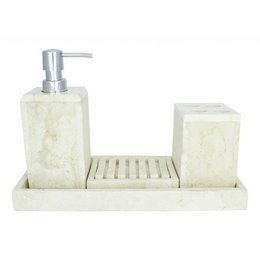 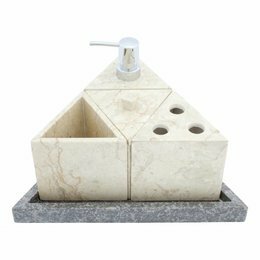 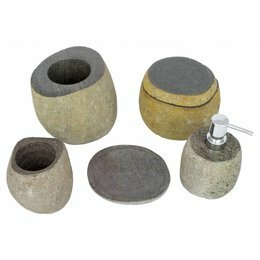 This 5-Piece Marble bathroom accessory set Rangga contains a soap dispenser, soap dish, toothbrush cup, jewellery box and a toilet brush holder. 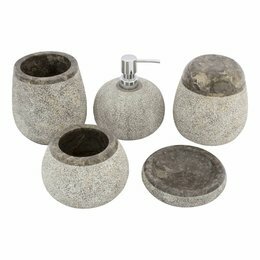 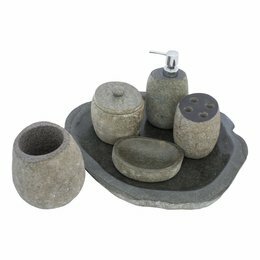 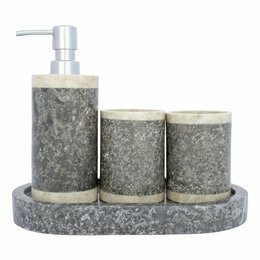 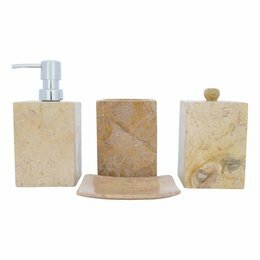 These 4 to 6 piece bathroom accessory sets of Marble, River Stone, Petrified wood, Onyx and other natural stones are selected for you to give your bathroom a luxurious and comfortable look. 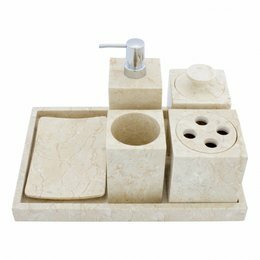 They include a Soap dispenser, Soap dish, Cup or Holder for the Toothbrush, Toilet brush holder, Tissue box, Jewelry box, Tray and there is even a few bathroom accessory sets with a Trash can. 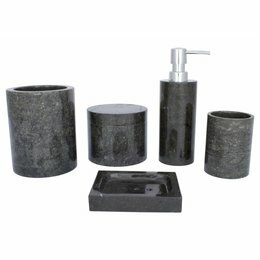 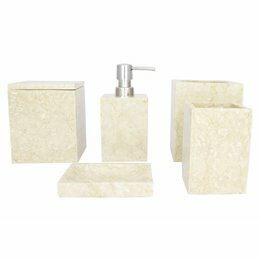 You can also order all items from our sets separately to create the perfect bathroom look for you.